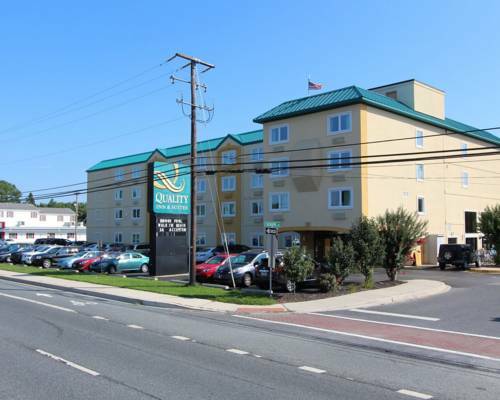 The Quality Inn and Suites Rehoboth Beach-Dewey hotel gives you real value with peace of mind. Our smoke-free hotel is near Dewey Beach, Cape May-Lewes Ferry, Tanger Outlets and Sussex County Airport. You'll get easy access to activities like parasailing, deep-sea fishing and boating. Enjoy our amenities that include free continental breakfast, free WiFi, free weekday newspaper, free coffee, a fitness center, indoor heated pool, guest laundry facility and business center with a meeting room and copy and fax services. Each inviting guest room features a refrigerator, coffee maker, TV, hair dryer, iron and ironing board. Also, earn rewards including free nights and gift cards with our Choice Privileges Rewards program. A Vietnam-era Navy relic that's hard to miss along Highway 1, painted gold and drawing the eye to the owner's seafood restaurant. ~25 miles from Rehoboth Beach. Boy this abandoned freighter sure is spooky. Thank goodness we're the only ones here wait what was that noise Agghhhhhhh! Fun on the Jersey Shore. You can't fight a war without stuff -- and flying that stuff where it's needed is the job of the Air Mobility Command. Museum includes a hangar full of exhibits and tarmac of old military planes. ~32 miles from Rehoboth Beach. A unique, multi-story 19th century building open for tours. "The only elephant you can go into and come out of alive." ~53 miles from Rehoboth Beach.